As promised, I’m back with my recipe for coconut buttercream to top the coconut cupcakes I shared last week. 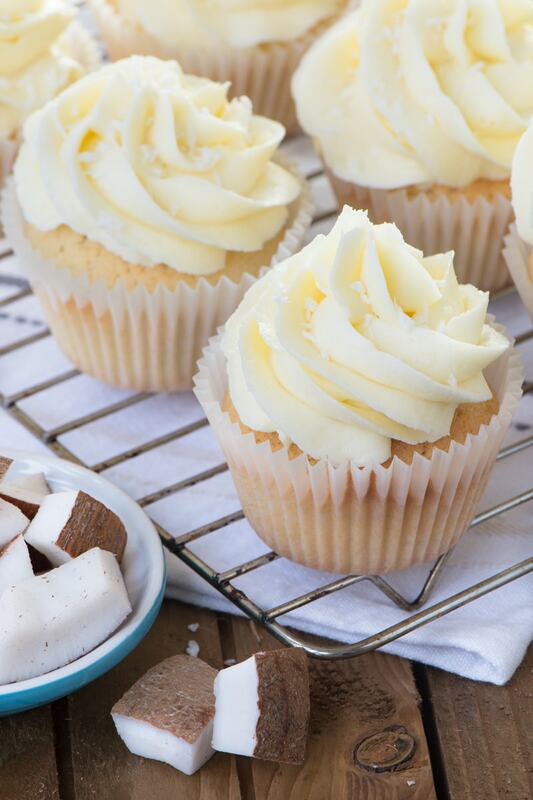 As with the cupcakes, the key to getting lots of coconut flavour into this buttercream is using creamed coconut block from the asian food aisle. It also means that your buttercream is lovely and smooth so it’s perfect for piping. The cupcakes recipe was accidentally dairy-free so perfect for anyone with an allergy or intolerance. This buttercream recipe isn’t dairy-free, however I’ve added details just below the main recipe to make a simple adjustment to make this dairy-free and vegan. Before you start, make sure you have all of the equipment needed. NOTE – These are affiliate links which means that if you purchase from Amazon after clicking on one the product links below I may earn a small commission. All of the products linked are ones I use in my kitchen. 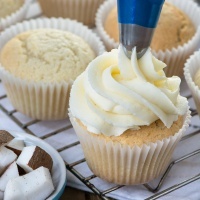 Piping Nozzle – To pipe the cupcakes as shown in the pictures you’ll need a JEM 1B nozzle. Melt the creamed coconut (200g). This can either be done in the microwave in bursts of 20 seconds, mixing between each one, or on the hob over a very low heat. The consistency of the coconut should be thick but easily stirred. Leave to cool. Cut the butter (200g) into cubes and beat (either by hand or with an electric mixer on a low speed) until smooth. Add the icing sugar (300g) and beat until fully combined – I prefer to add the sugar a couple of spoonfuls at a time as this minimises the amount of sugar that flies out all over the kitchen! You’ll find that at first it’ll start to look lumpy but keep persevering and it’ll smooth out. Gradually add the melted creamed coconut, beating in each addition before adding more. Take a look at the consistency of your buttercream. If it is a spreadable/pipeable consistency then it's ready to use. If it is a little too stiff then add milk (no more that 1 tsp at a time) until you have the right consistency. Beating in each addition of milk fully before adding more. 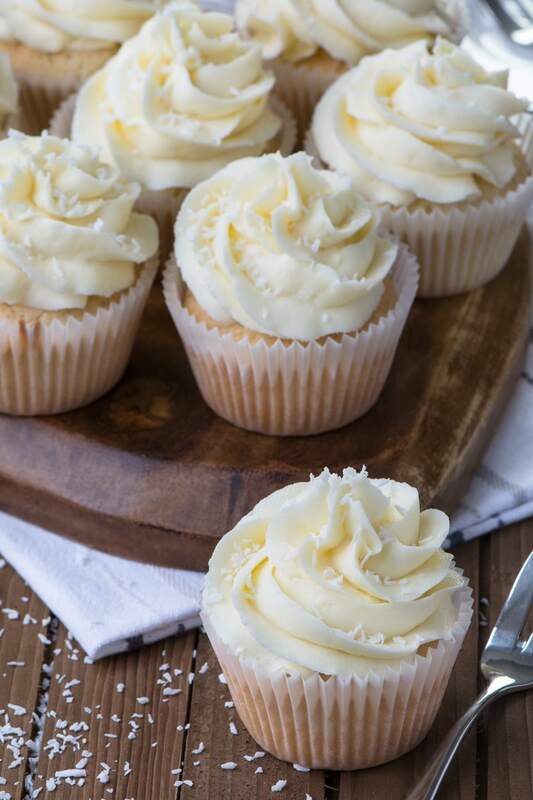 Looking for a cupcake to top with this buttercream? You can find all of my recipes in my cupcake index. Adapting this recipe to make this buttercream dairy-free (and also vegan) is really simple. All you need to do is switch the 200g of butter for 100g dairy-free margarine (I use Pure Sunflower) and 100g baking block which is soft at room temperature (I use Stork). Replace the milk used to get the buttercream to the right consistency with coconut-milk (or other dairy-free milk). The method for making the buttercream is exactly the same as for the recipe above. Perfect flavour and consistency, just what I was looking for. I suspect is because it’s usually use for more savoury dishes and isn’t in the baking aisle. I only tried it on a who because I had some in the cupboard. I’m very glad I did!